Fourth Row Center: Film Writings by Jason Bailey: On DVD: "A Town Called Panic"
The film's universe is populated by a cast of plastic toy figurines. Three of them share a house: Cowboy (voiced by co-director Stéphane Aubier), Indian (Bruce Ellison), and Horse (co-director Vincent Patar). Cowboy and Indian accidently forget Horse's birthday, and in their panic to order bricks to build him a barbecue, they inadvertently over-order by several million. Hijinks ensue. A Town Called Panic utilizes and odd but enjoyable style--of animation, and of storytelling. 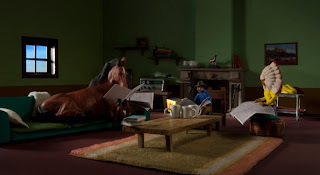 The picture has a charmingly homemade feel, with the stop-motion figurines hopping about on their flat stands, replicating the tone of an imaginative kid playing with his mismatched toys. It's got a peculiar, off-balanced sense of humor, and the scenes are busy and frequently funny (particularly Horse's birthday party, which goes wonderfully out of control). The trouble is the relentless, unvarying pitch and volume begins to get wearying. Much of the dialogue is delivered in what amounts to a scream (the title is a fairly accurate description of most of the characters' state of mind), and the speed and tenor of the material is built to match. The picture loses steam in its second act, in spite of an increase in the pace and the slapstick; it burns off much of its running time basically running in circles. I can't undersell the energy and inventiveness of the stop-motion animation; the movie is a wonder to behold, to watch wind up and spin around. Unfortunately, it enters the marketplace on the heels of Fantastic Mr. Fox, a stop-motion animation tale with a narrative to match the gee-whiz power of its visuals. There's much to like in A Town Called Panic, but it doesn't go much of anywhere once it has laid out its style and premise; it is an ingenious but monotonous piece of work. "A Town Called Panic" hits DVD on Tuesday, July 20th.